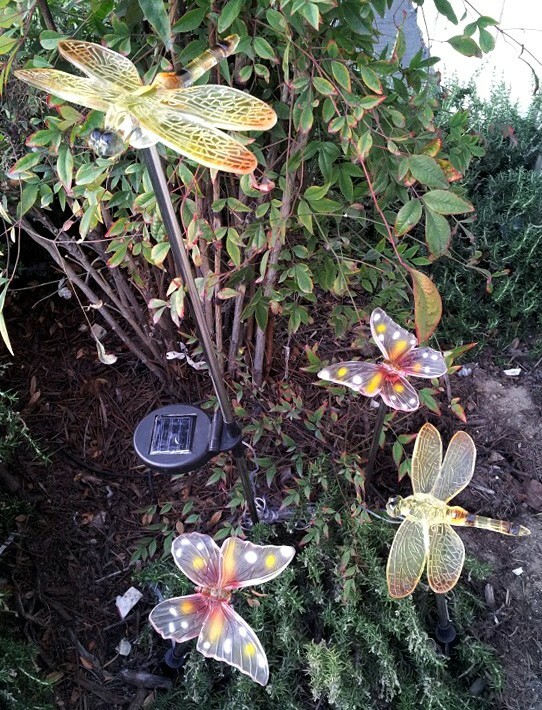 Add these colorful butterflies and dragonflies with solar powered lights to your garden, flowerbeds, walkways, patio, landscape or any favorite outdoor area for an interesting addition day and night. Each set is equipped with one integrated solar panel on a stainless steel stake that powers and lights all four stakes at night. The clear acrylic butterfly & dragonfly will illuminate at night giving your garden a special lighting effect. Easy to install just simply install the larger stake with the solar panel in an area that receives full sunlight during the day, then you can place the other 3 smaller stakes up to 52” away, giving your garden that special touch day and night. During the day these solar garden stakes solar panel with charge under sunlight, then when night falls the lights will automatically turn on and will illuminate up to 8 hours each night.